Kate Silva, PA-C along with Katrina Borner, APRN and Tim Johnson, PA-C enhance the practices of Dr. Christopher Hansen, Dr. Ana Manuel and Dr. Gregory Stepp in our Family Medicine Department. They provide a team approach designed to increase appointment access and quality care. Kate Silva, PA-C, is a certified physician assistant with the White-Wilson Medical Family Medicine team. Ms. Silva went on a medical mission trip to Suriname, South America, where she found her passion helping others for a living. Ms. Silva received her Master of Physician Assistant Studies from the University of Florida in Gainesville, Florida. 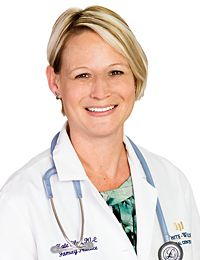 She works along side Dr. Christopher Hansen, Dr. Ana Manuel and Dr. Gregory Stepp at the White-Wilson Family Medicine Clinic in Fort Walton Beach, and specializes in wellness exams, physicals, urgent care illnesses and preventive medicine. Ms. Silva is an Emerald Coast local, and enjoys spending time with her family and three children. She has always loved living on the Emerald Coast and is an avid beach goer.